We poor saps in the US haven’t had the pleasure quite yet, but some viewings across the sea have resulted in a large number of early reviews. We’ve canvassed far and wide to bring you just about everything we could find, and yanked out some choice quotes to give you the finest, oak barrel-aged gist we could distill. So what is this consensus? Well, most agree that Spielberg shows chops here like he hasn’t in some time, and almost unanimous praise is given to the sophistication of the action sequences and quickly-paced adventuring. The picture gets more complicated from there as many definitively state that this is the crown jewel film for both 3D and motion capture, while others aren’t quite convinced. Sticklers for Tintin canon too seem a bit miffed about potentially flat characterization and writing that might modernize a bit too far, but for the most part the heart of the film is well appreciated. It is somewhere between Pixar and live action — a new level of computer reality. While too many films use 3D as a cheap afterthought, Spielberg has seen its true worth for immersing the audience in another world. 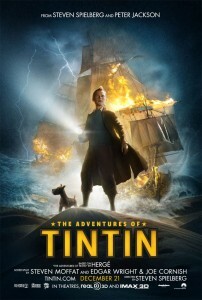 It is just surprising it has taken so long to make a great Tintin movie. Belgian writer-illustrator Hergé’s tales of the intrepid boy journalist and his dog Snowy are packed with action and humour. Perfect for cinema. As the action moves from Europe to Morocco and back again, the pace is well maintained and the story never seems to overstay its welcome, which is not the case with many recent blockbusters. John Williams’ score, which mixes moody 60s-style music with the composer’s more grandiose themes, accompanies events up through the rather ingenious finale (involving a massive duel where shipping cranes are transformed into sabers), before a cliffhanger sets up the next installment (to be directed by Jackson). The film quickly kicks into high gear and rarely lets up, it truly is an adventure film from the get go, with not a dull moment in sight. The only problem I had with this was that I felt it perhaps caused some characterisation to suffer a bit, with Tintin’s motivations perhaps lacking at times. Despite this the protagonists have a charm and likeability which has you rooting for them the whole way through, and I am glad that they avoided the origin root so many films go for with Tintin’s backstory being told quickly and succinctly through framed newspaper articles. With its dizzying spectacle and fast-paced action, The Adventures of Tintin is top notch entertainment and miles ahead of its performance capture predecessors in its wit and visual sophistication. Expect audiences to lap this up when it makes its cinema debut later this month. …there’s a mechanistic quality to Spielberg’s craft that’s undoubtedly disappointing: a film directed by one such distinctive artist and based on the work of another shouldn’t feel like it could have been made by almost anyone. …however much more successful the technique is here than it has been elsewhere, crucially it’s not successful enough. The script…sit[s] uneasily with the wry humanism and neat satire of the books: this is less an adaptation of Hergé’s writing than a kind of airless pastiche of it. Viewed from a distance, The Adventures of Tintin stands proud as freewheeling, high-spirited entertainment. But those close-ups are painful, a twist of the knife. There on the screen we see Hergé’s old and cherished protagonists, raised like Lazarus and made to scamper anew. But the spark is gone, their eyes are dusty, and watching their antics is like partying with ghosts. Turn away; don’t meet their gaze. When we stare into the void, the void stares back at us. 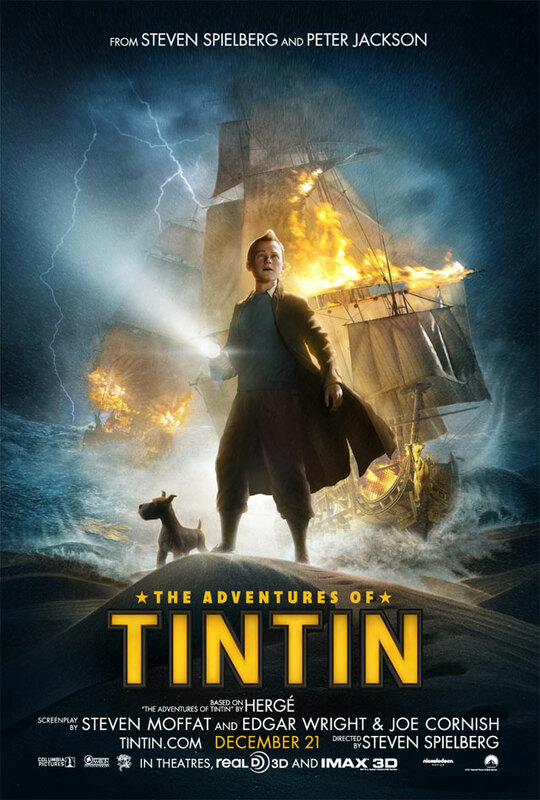 …delivers one thrilling set-piece after another in a way that suggests that Spielberg has not only pulled out his Indiana Jones toolbox but has decided to pack anything and everything into Tintin that the logistical, budgetary realities of shooting live action won’t let him do. Let off his leash, he’s clearly having a blast, and so do we.